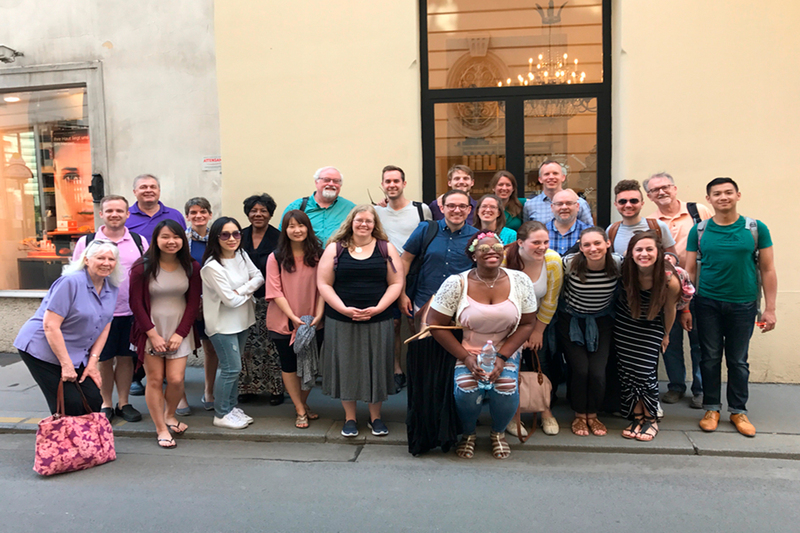 The University of Illinois Chamber Singers performed with the chamber choir of the Vienna School of Music as part of a 12-day European trip this summer. 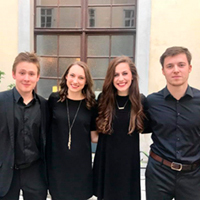 Members of the Chamber Singers are, from left, Aaron Godwin, Grace Currie, Colleen Bruton, Kathy Kew Lee, Jennifer Kew, Patrick Murray and Joseph Baldwin. 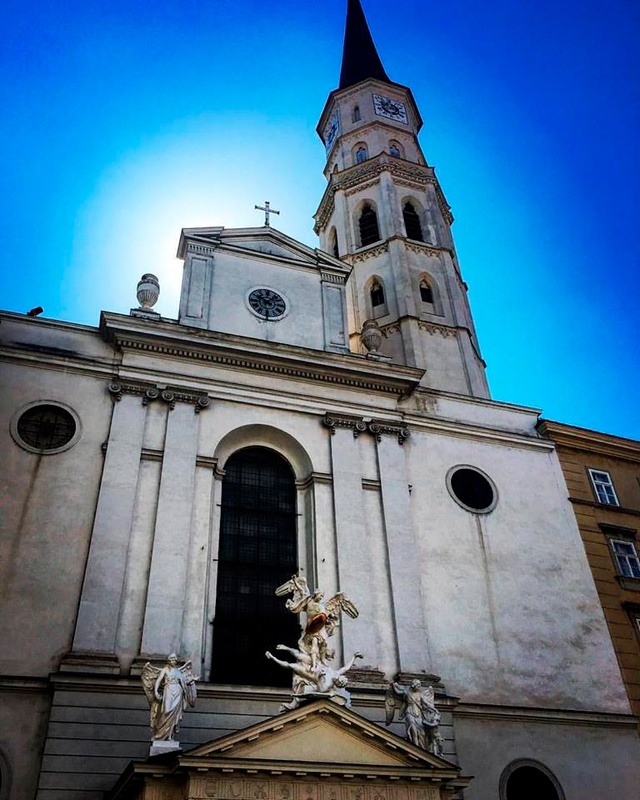 VIENNA, Austria – I wake up for a full day of music making in beautiful, sunny Vienna. I am one of 26 performers here with the University of Illinois Chamber Singers. 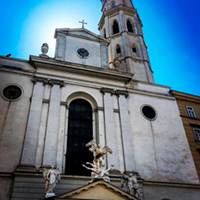 The exterior of St. Michael's Church in Vienna, where the Chamber Singers performed with members of Webern Kammerchor, the chamber choir of the Vienna School of Music. 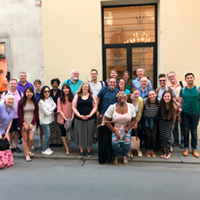 We head to St. Michael’s Church for a dress rehearsal for our concert – “Choral Bridges.” We will perform tonight with the Webern Kammerchor, the chamber choir of the Vienna School of Music. This choir came to Illinois to perform with us last year, and invited us to Vienna to perform with them this summer. I say “hi” to my friends in the choir and chat for a bit, and then the rehearsal starts. Singing early in the morning is not usually easy, but we share some laughs during vocal warmups as we try (and fail) to pronounce German tongue twisters to improve our diction. Once the rehearsal begins, I bask in the great acoustics of this church. The sound makes me feel like I am finally living everything I learned about in my music history classes – as though I am living in the time that Haydn composed, while singing in the church in which Mozart premiered his requiem. I can hear my voice and the voices of the choir echoing through the same church in which famous composers, singers and instrumentalists echoed their sounds. Now I cannot wait for tonight. 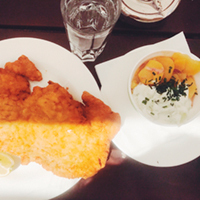 Before their concert, the singers sampled schnitzel from a local restaurant. The evening brings the long-anticipated concert. As we line up to enter the church, I am nervous and ecstatic for my very first concert in Europe. But I can totally “Handel” it (ha ha). The first downbeat of Benjamin Britten’s “Cantata Misericordium” fills me with emotion as we sing “Beati misericordes” (blessed are the merciful). Visa Yrjölä, Grace Currie, Colleen Bruton and Jakob Führer before the concert. Visa Yrjölä and Jakob Führer are from the Webern Kammerchor, the Vienna School of Music choir. 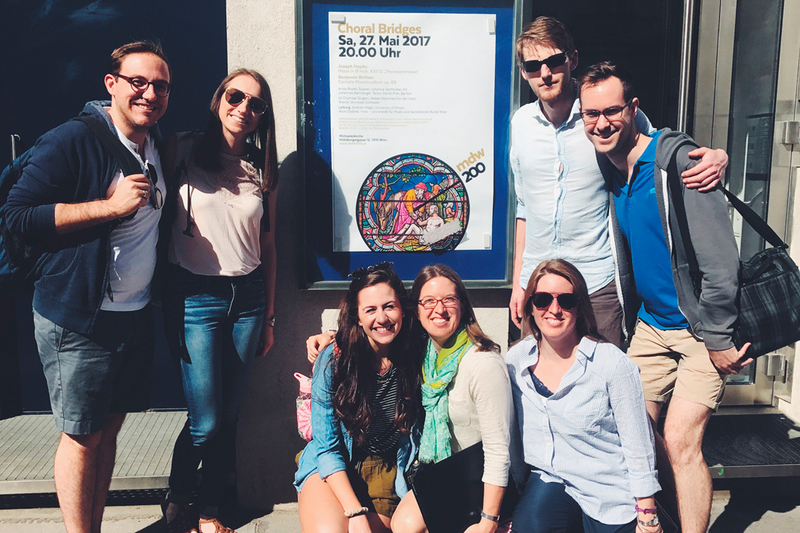 The Chamber Singers pose outside St. Michael's Church in Vienna. Next, we sing Franz Joseph Haydn’s “Theresienmesse.” I dance on my toes (lightly so that the audience doesn’t see, of course) as we sing the Gloria. I feel the austere, huge sound of the closing movement, the Agnus Dei. 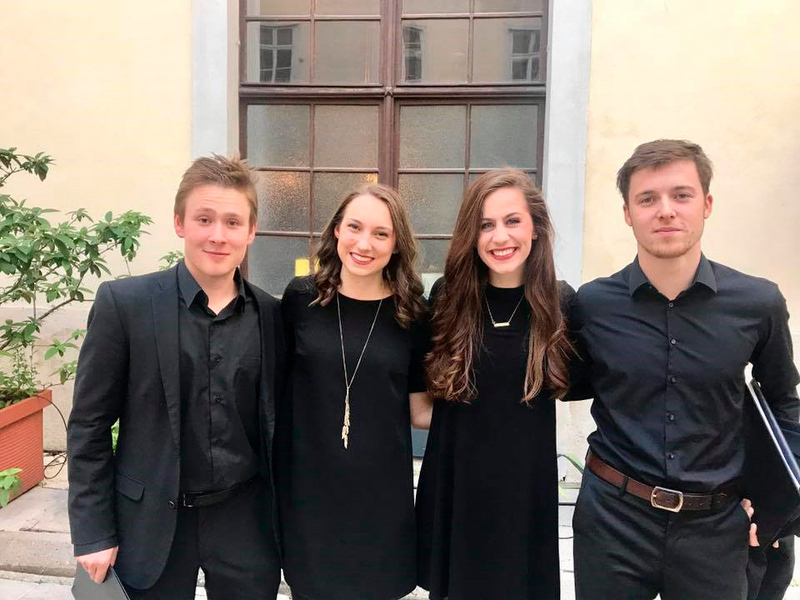 The concert is an unforgettable experience for me because I get to perform with my best friends in Chamber Singers and with my new friends from Vienna. The most meaningful musical experience is when we perform with people we love and who share the same passion. 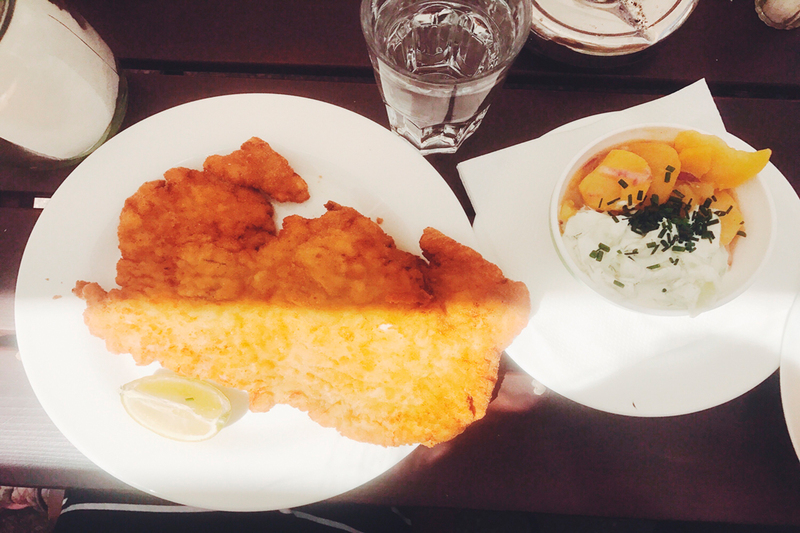 I wouldn’t trade the laughter, schnitzel and wonderful music for anything.